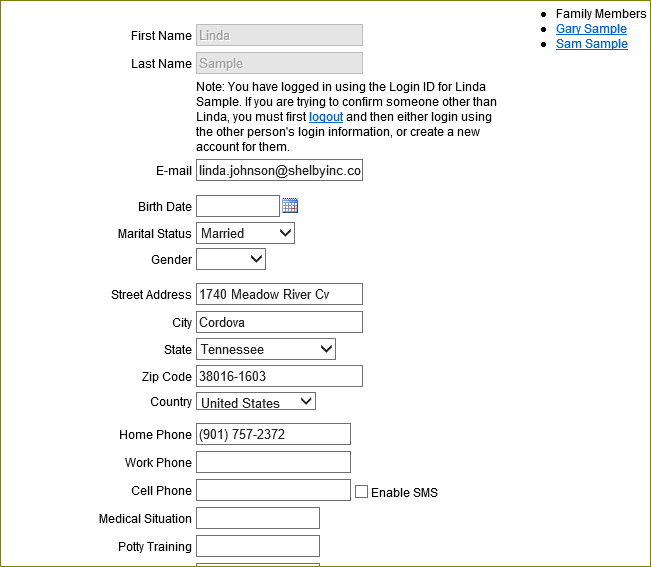 Consider using the User Confirmation Module so that members can specify fields for each family member. This module has one required module setting for Member Status and several optional settings such as sending an email to designated recipients when updates are made, especially given updates are immediately applied. In addition to configuring the page and module, customize the User Confirmation Notification System Email. If you use this option, set the Redirect module setting of your User Login page to “~/default.aspx?page=<page number>”, (where <page number> is the page ID number of your User Confirmation page) and the Redirect module setting of this User Confirmation module to “~/default.aspx?page=<page number>” (where <page number> is the page ID number of either your home page or your member’s home page). The Redirect module currently redirects the user to the existing page/tab. To redirect to a new window, consider using the Advance HTML module and create a link in this module. The User Confirmation module bypasses security for edit rights.